A luxurious & spacious 173.6 square meter private apartment, on the sunny, dry southern coast, in the fashionable district of Garajau. Spectacular panoramic views of the Atlantic Ocean from the 30ft x 40 ft south facing private roof terrace, perfect for a lazy day spent sunbathing & relaxing. An ideal setting for al fresco dining. There is a further west facing balcony off the double bedroom and lounge. The accommodation is open plan. The lounge, dining area and kitchen to the south, the bedrooms and bathrooms to the north. In Garajau, there are several restaurants, bars, bakery & coffee shops, ice cream parlours and a few patisserie, 2 hypermarkets and a medium sized well stocked supermarket with ATM outside. Golfers will be pleased to know that the new 18-hole Palheiro golf course with stunning views is no more than a 20 minute drive. The spectacular 27-hole Santo da Serra golf course home to the Madeira Island Open is also within easy reach. Indoor & outdoor pool at nearby hotel. Golf: Golfers will be pleased to know that the new 18-hole Palheiro golf course is no more than a 20 minute drive. Classic Madeiran hills, ridges and deep valleys have all been incorporated into the terrain to produce a dramatically interesting course, with stunning views. The spectacular 27-hole Santo da Serra golf course [also known as Campo de Golfe and home to the Madeira Island Open ] is also within easy reach. This is Madeira’s oldest golf course. It sits high up on a plateau and is marvelously scenic with inspirational views back up the mountains and out over the Atlantic below. Hiking & Walking : Garajau is a good location from where one can hike and walk the islands amazing levada irrigation system spanning 2,500 kilometres, which meander round the mountains. We recommend you use Turitrans (please, contact us for link with further information). They do trips in small groups of 8, using mini-buses. Entertainment: Locally in Garajau there is entertainment nightly in the Don Pedro Hotel. It is worth just popping in there and picking up their program for the week, then on route from a restaurant in the evening you can pop in, if something takes your fancy, or just for a night cap. I am self employed and the intention was to move to Madeira when I retired. Unexpectedly I am still working. As a future home I needed a property that would be big enough to live in all year round, but also want to be able to lock it up and go away. Apart from the fantastic space, the main attraction is the panoramic sea views. One can see the sea from every room. We absolutely love the space, the large private terrace, panoramic views of sea from every room, from both conservatories and from the south facing terrace and west facing balcony. Very large walk in shower in the en suite bathroom. Shower over bath in main bathroom. Everything is as described on the website. Excellent communication from the original enquiry through to being dropped off at the airport on the way home. Connie made the whole process very simple and the arrangement with Susy for taking you to the apartment ensures you can start relaxing straight away. The apartment has everything you need for a comfortable stay and you will be blown away with the terrace and the fantastic views. I have no hesitation in highly recommending the apartment and would definitely return again. The apartment is at the top of a small block in the suburban town of Garajau. It's not really a tourist hot-spot. There's a hotel on the High Street but most people around are local and the shops sell local produce at everyday prices - great if you want to use the well-equipied kitchen to self-cater as we did. The town is well placed to visit Funchal by bus or car and is close to the expressway giving quick access to other areas of the island. We did a lot of walks all over the east of the island and found the apartment to be the perfect base. The apartment itself is very spacious and clean with great sea views from the terrace. Connie, the owner, was very helpful throughout, especially when our flight was cancelled and we had to extend our stay. She even helped us take care of things back home and made what could have been a stressful three day delay into an extension of the holiday. Highly recommended. 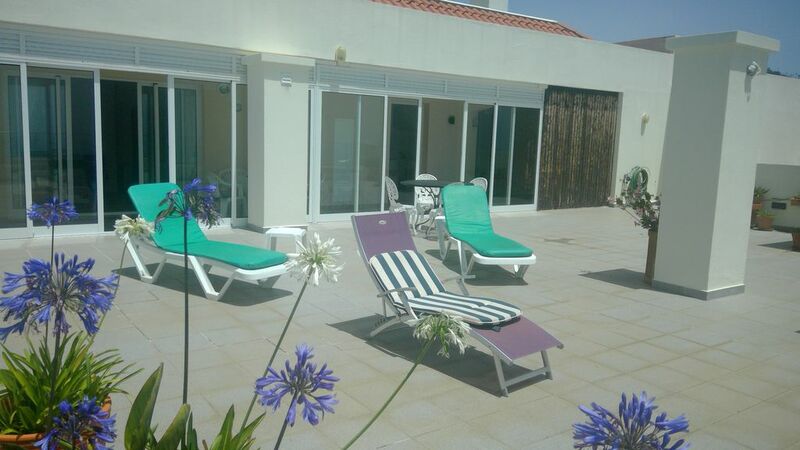 Comfortable and very well-equipped apartment in quiet residential block with the most amazing sun terrace - incredible size and views out to sea. Good range of local shops and restaurants within 5 - 10 minutes walk and bus stop to Funchal right outside - don't miss out on the fun of high speed local Madeiran transport round most bendy roads known to man! Excellent pre-arrival information provided and really grateful to Connie and Suzy for flexibility and help when return flight delayed for 24 hours. Garajau named after the black-headed sea birds, terns, rest in the cliffs. Just below Garajau is a 200m high headland - Ponta do Garajau with a fine miradouro - a statue of Christ with outstretched arms, similar to the larger statues in Rio de Janeiro and Lisbon. It was erected in 1927. This is a wonderful spot to watch the sun go down and it has great views west to the Bay of Funchal. The beach area was upgraded in 2007 and includes a restaurant. A cable car provides access to the beach. The coastline here at Garajau is also a conservation area and was one of Europe's first underwater nature reserves, providing sanctuary for whales, dolphins and seals. Along the coast to the east is Canico, the nearest large town and in front Canico de Baixo the costal holiday resort. Golf: The 18-hole Palheiro golf course is used primarily by the English ex pats living on the Island. There is a very nice restaurant and shop attached to the club. They very much welcome visitors to join in a game or competition. Sunday is particularly popular with good humour and good company in and out of the club house all day. Rate is for the apartment. Not per person, @ £370 per week when 2 people share. There is a charge of £7.50 per night for each additional person max 4 share. We facilitate payment in either Sterling or Euros, paid by bank transfer. We also accept 3/4 day and 10/11 days bookings and also accommodate long stay rentals. Rates include linen and weekly housekeeper service. A taxi service is provided both ways to and from the airport @ €25 each way payable direct to the taxi driver. If you hire a car there is a one off charge of €15 to collect the keys.